We all know that Mud robs horsepower. This is why the guys running in the Mud Outlaw class at Mud Truck Madness run so much horsepower thanks to loads of nitrous. Well it takes an incredible amount of horsepower and traction to do a wheelie in a mud pit. This driver did just that. Duke Bohanon is the driver of this Nasty Mud Truck called Wicked Sensation. He stabs the throttle off the starting line and rides a wheelie down the mud pit lets off it allowing the front tires to land then gets back immediately in the gas and does a slap wheelie. The crowd goes wild and so does the announcer. 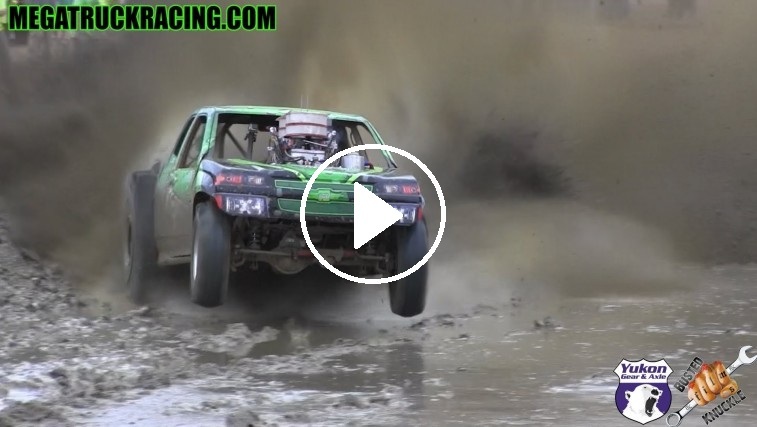 This has got to be one of the most insane things I have ever seen at a mud racing event. His crew must have went and took some power out of it because Duke came back for round 2 and ran a fast pass with all 4 wheels remaining in the mud. For more Mud Outlaw Videos check out the Busted Knuckle Video Youtube Channel and Subscribe. Watch More Mud Outlaw Mud Racing.